This is a tool I came up with to help my elementary students stay organized. 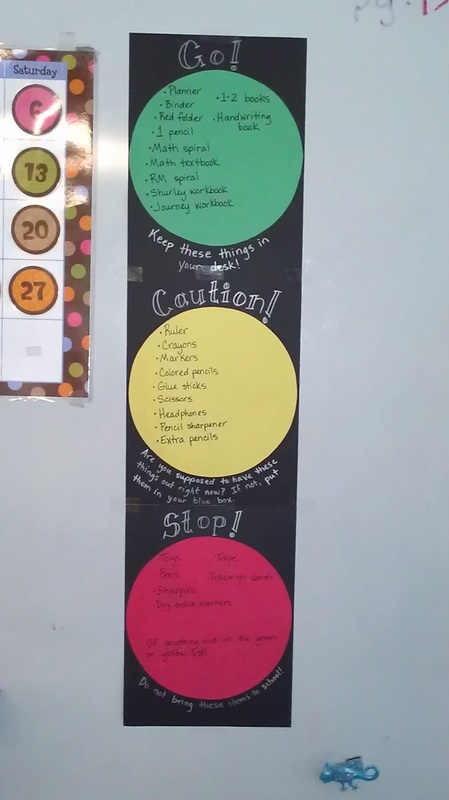 I implemented this well into the school year, as I realized that some of my students needed a visual and concrete list, but I think starting this on the first day of school would be even better. This tool has helped my students to stay organized by having a definitive list of what they should have in their desks. When a student's desk starts getting messy, I have him take everything out and put back only those things that are on the Green List. It really helps them know exactly what to do with every school supply. 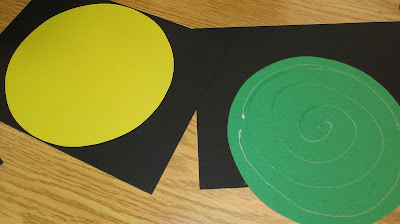 This tool has also helped prevent me from having to make judgment calls about the random things elementary students decide to bring to school--and I do mean random! It amazes me, the things students think would be a good idea to bring to school (and the things parents *let* them bring to school!) I refer quite often to the "Green List", "Yellow List", and "Red List", and it has cut back on this problem significantly. I can just ask one of my kids, "Is that on the Green or Yellow list?" and they know if it isn't, the item needs to stay in the backpack that day and not come back to school the next. 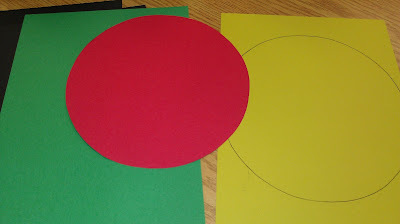 To make a Stoplight Organization tool yourself, you'll need 3 sheets of black construction paper, and 1 sheet each of green, yellow, and red. You'll also want a black Sharpie and a silver Sharpie. You can find metallic silver Sharpies at Amazon, and they are so much fun! I use mine for all kinds of things. Using something like a paper plate, cut a circle out of the green, yellow, and red papers. Glue each of the circles onto the center of a black sheet of paper. Let the glue dry. 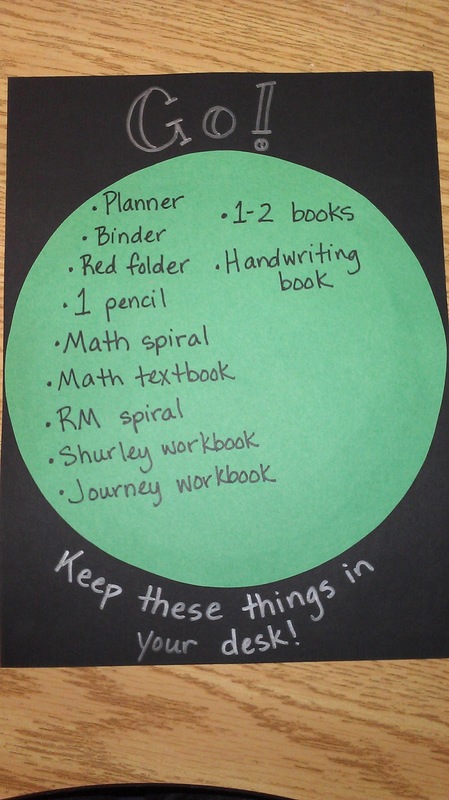 This might be a good time to think about what you want students to have in their desks at all times--the Green List--and what you want them to have only sometimes, with permission--the Yellow List. Everything else goes on the Red List. For the Green List: Write "Go!" at the top, and a message at the bottom that says something like "Keep these things in your desk". On the green part, write the list of items you came up with above. I really recommend thinking about having students keep only the items they need every day in their desks. For the Yellow List: Write "Caution!" at the top. At the bottom, write something like, "Are you supposed to have these items out right now? If not, put them _____________." On the yellow part, write out the things you want them to keep put away. Your Yellow List may look a little different depending on how you run your classroom. 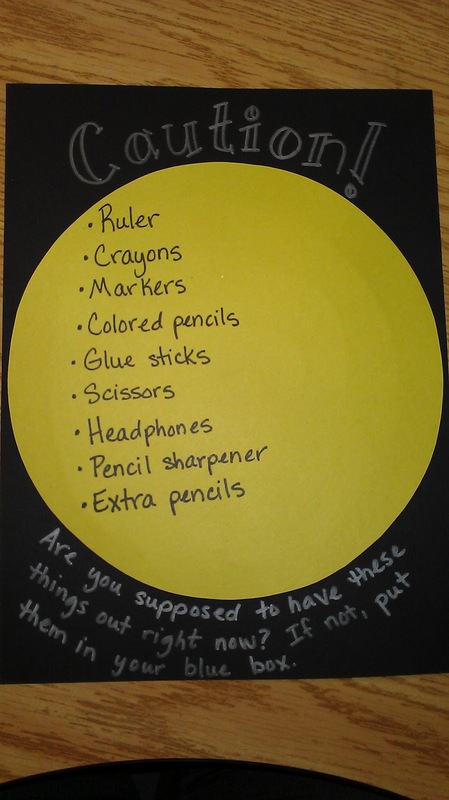 If you choose to use community supplies, these might be the items you write on this list. I do not do community supplies, but I have provided every student with a plastic box to store those supplies that we only use once or twice a week. 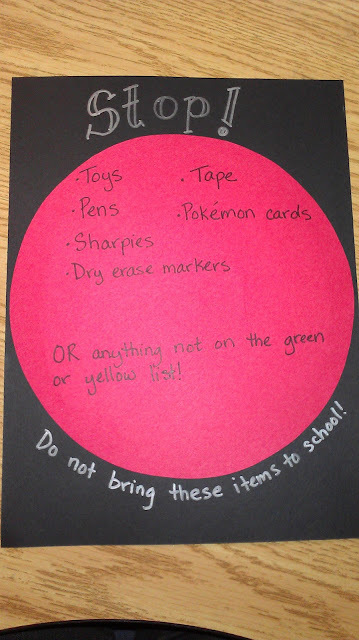 I also added items to this list that my specific students tended to play with if they were kept in their desks. The fewer things there are in their desks for them to mess with, the fewer distractions there are from learning! For the Red List: Write "Stop!" at the top, and "Do not bring these items to school!" at the bottom. On the red part, write out the list of things you do not want students to have in your classroom. I also added the caveat "Anything not on the Green or Yellow List" to eliminate all of the thousands of items I did not specifically name. I did not intend the Red List to contain a list of school-prohibited items, like weapons, etc. This is my own personal list for my classroom. I could have kept it simple by merely writing the bit about "Anything not on the Green or Yellow List", but I wanted to spell out some things specifically. I picked the most common items that this particular group of students kept trying to sneak to school and listed those, which is what I recommend for this system. Your list may look entirely different from mine. Finally, tape the pieces together and display it in your classroom. Go over this with students in detail, and then refer them to the list when they try to bring extra "stuff" to school or cram their desks full of things they don't need. I would love to hear how this works for other teachers out there!